Quick message to explain how to start a new collection, and purpose of watchlist. This is shown to users who have seen the blue pointer overlay (if they've dismissed it they do not see this). 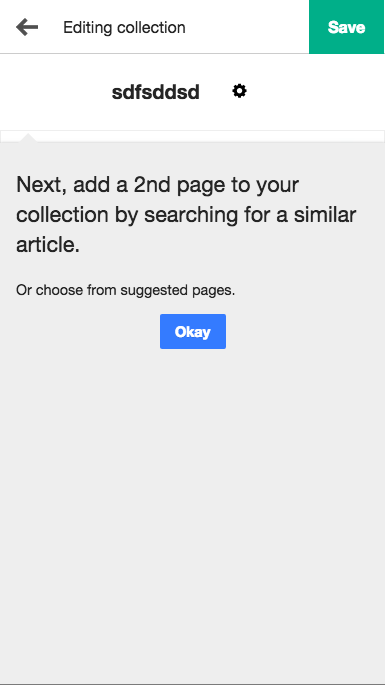 Quick message to prompt users to add a 2nd article. This will only show when you have 0 collections (excluding watchlist). KLans_WMF added projects: Readers-Web-Backlog, Mobile-Web-Sprint-49-Wayne's-World. KLans_WMF moved this task from To Triage to 2015-16 Q3 on the Readers-Web-Backlog board. I think both of those overlays should have the close button for the not interested. • rmoen moved this task from To Do to Doing on the Mobile-Web-Sprint-49-Wayne's-World board. @Jdlrobson I self -1 as I was stuck on optional third parameter in route. Right now it is not merge-ready as the third parameter is required. I got close with the regex. Please advise if you can. Thanks. @rmoen needs to make a minor fix up and I'll +2 his change. @JKatzWMF I'm unable to replicate the issue with the pointer being over the searchbox. It seems the search icon is missing and it had issues positioning itself? We just changed the search icon in MF and I had a similar issue when writing this change. Perhaps a hard refresh and test again ? 1st tippy is working 100% of the time now for me. Not sure what I'm trying to replicate here. Making a patch now for the min height on the edit overlay tutorial. Will continue to test these locally but I'm still unable to reproduce bugs yet. @JKatzWMF by "-1st tippy" Are you talking about ? This is the only "Tippy" I see out out place. This has been discussed in IRC. @KHammerstein agreed this should be hiding the lower portion of the overlay content as to keep eyes focused on the search input. Positioning issues were ruled to be cache related. Moving to ready for sign off. @JKatzWMF: I'm also unable to replicate the pointer issue. 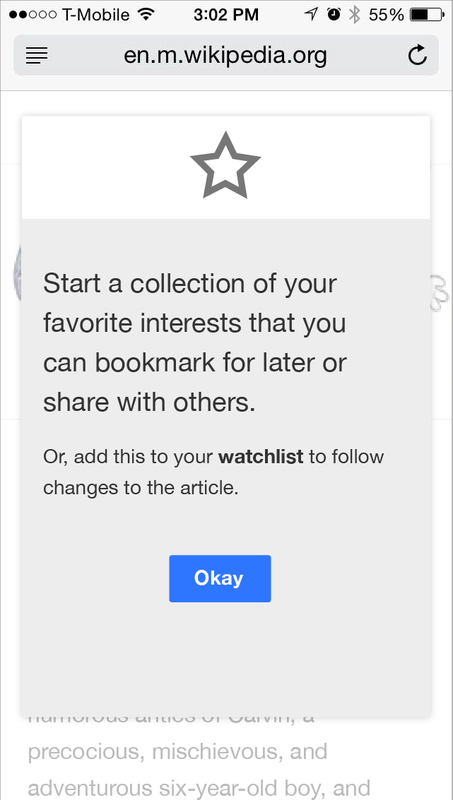 In the first step, "watchlist" isn't emphasised as in the mock – I feel a little twinge of guilt bringing this up. 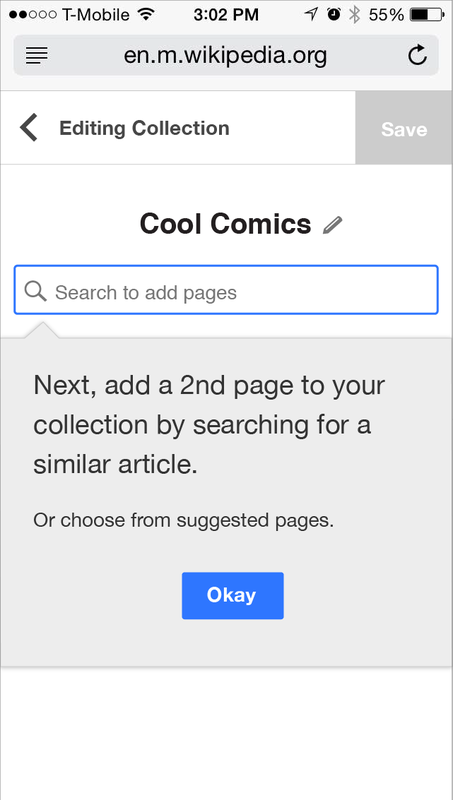 In the second step, when the user starts searching by tapping the search box, shouldn't the overlay close as if they'd hit the Okay button? Yes the overlay closes - they jump directly into search. If they tap Okay, the overlay just closes. Either that or i just don't know how to whitelist them locally. Can't find any documentation on this either. @Krinkle can you advise? @Jdlrobson After much investigation, this doesn't seem to work very well when configuring an extension with extension.json. Since MF isn't yet doing this, hard to replicate expected behavior without a working example. Updating the RL module with the following seems to make it not break, but still does not correctly parse the messages. Additionally, if I don't include the ["parsed"] after every message in the module it will not correctly register that particular message. I've tried multiple variations here with no luck. Let's get some browser tests in asap so this doesn't break again. I've started a patch to add browser tests for the onboarding tutorial here.